Made right here in Ventnor! 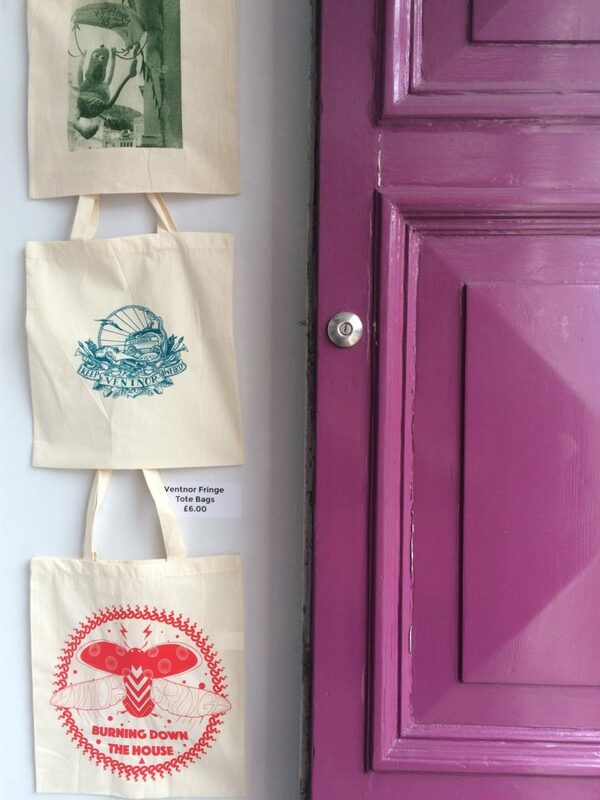 We’ve commissioned three of our favourite local artists Chris Jones, Katy Rose-Thorogood and Julie Hutchinson to create re-usable bags with special designs inspired by the Fringe. These are all handmade in Ventnor and are available now from the Ventnor Exchange priced at £6 each. Hi Julie, we love the new Ventnor Fringe tote bags! What was the inspiration for yours? Well, I have 2 sons who are nuts on cartoons and I love sewing my own characters. I really enjoy watching the Amazing World of Gumball with them, I like their crazy world and Fringe week always feels very similar, so I paired the two together and Parachuting Squashyface was born. He’s excited about Fringe Week and wanted to get into Ventnor Exchange first. Your going to be running workshops during the Fringe for people to make their own too, can you tell us more about that? I’ll be set up to screen print at Parkside every day between 2 and 4 . I’ve created a series of Gumball inspired images especially for Fringe week , a different one for each day and anyone can come and screen print their own tote bag with that design. If you can’t make it to Parkside then the tote bags will be available to buy from my website but they’re only available during Fringe week! Once they’re gone they’ll never be re-printed. Can you tell us a little bit about Atelier Ventnor? Atelier Ventnor is my new Screen printing studio that will be open in the next few months. I hold a teaching qualification and will be running workshops there to show people how to screen print. The studio will run workshops and also be an open access studio. That way , people can come and learn how to use the equipment and then use the facilities to print whatever they want! The studio isn’t open just yet but there’s loads of info on my website and once I’m able to run workshops I’ll be sending out a newsletter inviting people to book. Any top tips for anyone coming to the Fringe? Book up early is a good tip! Bring some cash and some suncream , a book and a good pair of shoes. That way you can see some shows, do some activities , eat out, stay all day, relax and soak up the great vibes that Fringe week has to offer. It’s like a mini holiday even if you live here. Choose something you wouldn’t normally go to see and you’ll be surprised! Thanks Julie, see you at the Fringe!